Roast lamb, hot cross buns and the ubiquitous chocolate egg: Easter is a foodie’s favourite holiday. Give your culinary creations the best backdrop possible with our guide to setting a colourful scene for an Easter Sunday lunch. It might be the de rigueur Easter colour combination, but don’t think that yellow and blue can't be beat. For a modern upgrade, consider adding in pink, too; the right shade (hint: more ‘blush’ than ‘Barbie’) will feel chic and fresh. Start with a crisp white tablecloth, then layer up complementing pastel shades. When in doubt? Take your cues from mini eggs’ candy hues. 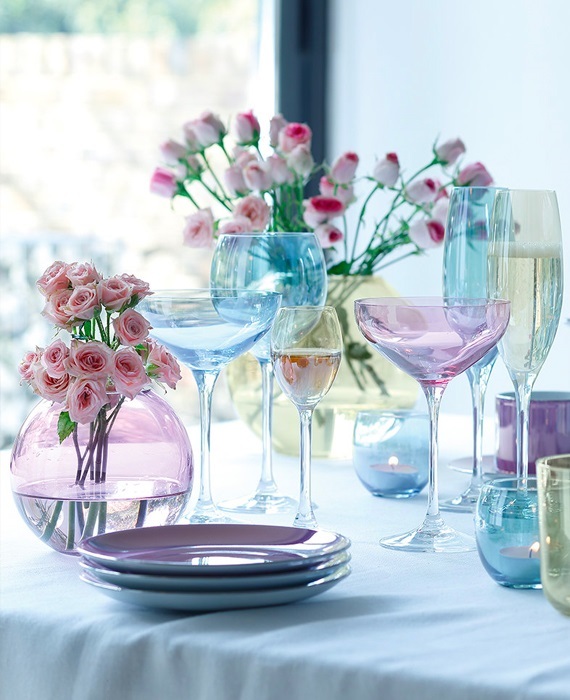 Coloured glass is back in a big way, and those vintage-inspired pastel shades are perfect for Easter dining. It’s a great way to ease colour phobics into the seasonal rush of colour, as the light-reflecting nature of glass prevents bright hues feeling heavy. These tinted tumblers and wine glasses are so easy to mix and match – and you’ll never lose track of which one is yours. As the ultimate symbol of new life, no Easter table is complete without a bunch of fresh blooms. Don’t overdo the daffodils if you’re not a fan of their distinctive scent - instead, take cues from other springtime favourites, like tulips, early blooming roses or even cascading branches of blossom. Add softness to the table by arrange in round vases in varying sizes. Scores of mini foil-wrapped chocolate eggs scattered along the table are a guaranteed crowd-pleaser, but far more fun is creating your own hand-decorated versions. Pick up polystyrene eggs from a craft shop - or just relentlessly boil the original variety - then paint in delicate hues, add glue in stripes or polka dots and dip in glitter. Add one to each napkin below a name tag.